Elevators are absolutely vital in tall buildings, but they have their limits — they can only move so quickly, and they can’t usually move sideways to fetch you from the far side of a building. Both of those problems should be solved at once if German firm ThyssenKrupp has its way. Its new Multi elevators ditch cables in favor of magnetic linear motor technology (also used in maglev trains) to move both horizontally and vertically, letting them service very wide or unusually shaped buildings. They can operate in loops and aren’t limited by heights, either, so it’s easy to put multiple elevator cars in one shaft. You’ll ideally never wait longer than 30 seconds for a lift, and the space-saving design lets building owners offer more (or at least larger) apartments and offices. Multi isn’t the first cable-free, horizontal elevator; MagneMotion already has a system in use onboard an aircraft carrier for delivering weapons. However, this may be the first that you’ll actually get to use. 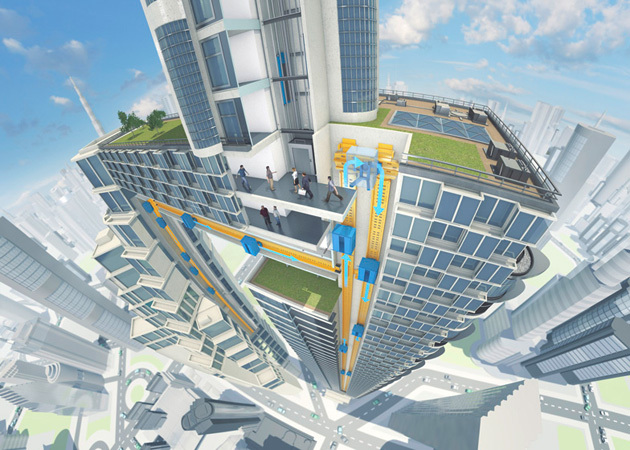 ThyssenKrupp plans real-world tests for its elevator in a trial tower around 2016, and the hardware is intended for civilian buildings. If all goes well, you won’t have to spend ages waiting to get to your intended floor in the future… even if it’s at the very top of a skyscraper.